Attenders posted messages with sidewalk chalk around the Golden Gate bridge Sunday. 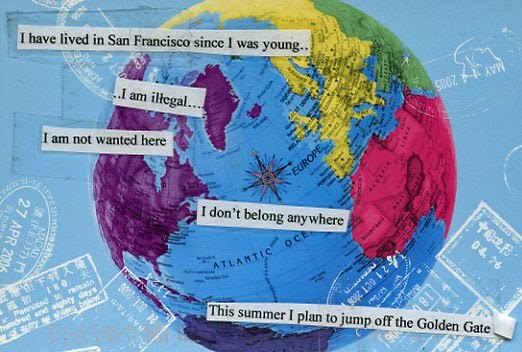 PostSecret posts the innermost secrets of anonymous readers on a weekly basis. Last week’s Golden Gate Bridge suicide secret sparked a movement that led a response past the Web. On June 6, a suicide secret posted on the site read: “I have lived in San Francisco since I was young … I am illegal … I am not wanted here. I don’t belong anywhere. This summer I plan to jump off the Golden Gate.” Within 24 hours, 20,000 people had joined a Facebook group contributing inspiring messages that begged the card’s writer to reconsider. By the weekend, the group’s membership had jumped past 60,000. But one California high school student took it even further, organizing a suicide-prevention rally at the Golden Gate bridge last Sunday. While the event drew only around 30 people and ran into permit issues, Katelyn Roberts, one of the event’s participants, posted a video of the messages the group posted near the bridge entrance. Those who gathered etched messages in sidewalk chalk, handed out yellow flowers with comments from the Facebook group and sent a yellow balloon sailing over the water. (Yellow typically represents suicide prevention.) “The flowers who were for those already lost and the balloon was a message to those who were still thinking about jumping,” Roberts said.